Mary Cassatt is a U.S. born painter of the French Impressionist school. Mary Cassatt studied in Paris, where she settled and became a disciple of Degas. 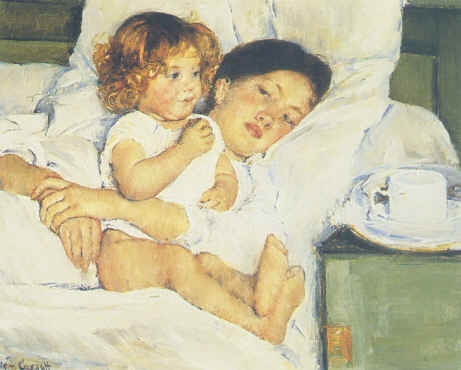 Her finest paintings were studies of mother and child, scrupulously firm and unsentimental, e.g. The Bath, Mother and Child, and her studies of everyday life in dry point and aquatint have recently received recognition. Young Woman Sewing is a fine example of her work in oil. Mary Cassatt made an exquisite series of colour prints under Japanese influence.